One of the foremost influences on 20th century sound and responsible for the world’s most famous guitar, the Les Paul model, Les Paul’s prestigious career in music and invention spans from the 1930s to the present. Though he’s indisputably one of America’s most popular, influential, and accomplished electric guitarists, Les Paul is best known as an early innovator in the development of the solid body guitar. His groundbreaking design would become the template for Gibson’s best-selling electric, the Les Paul model, introduced in 1952. Today, countless musical legends still consider Paul’s iconic guitar unmatched in sound and prowess. Among Paul’s most enduring contributions are those in the technological realm, including ingenious developments in multi-track recording, guitar effects, and the mechanics of sound in general. Tinkering with electronics and guitar amplification since his youth, Les Paul began constructing his own electric guitar in the late ’30s. Unhappy with the first generation of commercially available hollowbodies because of their thin tone, lack of sustain, and feedback problems, Paul opted to build an entirely new structure. “I was interested in proving that a vibration-free top was the way to go,” he has said. “I even built a guitar out of a railroad rail to prove it. What I wanted was to amplify pure string vibration, without the resonance of the wood getting involved in the sound.” With the good graces of Epiphone president Epi Stathopoulo, Paul used the Epiphone plant and machinery in 1941 to bring his vision to fruition. 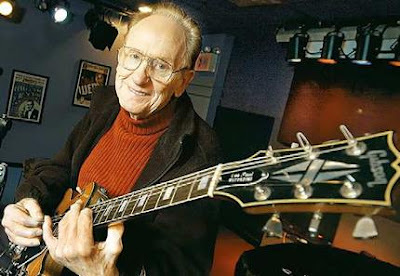 He affectionately dubbed the guitar “The Log.” Les Paul’s tireless experiments sometimes proved to be dangerous, and he nearly electrocuted himself in 1940 during a session in the cellar of his Queens apartment. During the next two years of rehabilitation, Les earned his living producing radio music. Forced to put the Pennsylvanians and the rest of his career on hold, Les Paul moved to Hollywood. During World War II, he was drafted into the Army but permitted to stay in California, where he became a regular player for Armed Forces Radio Service. By 1943 he had assembled a trio that regularly performed live, on the radio, and on V-Discs. In 1944 he entered the jazz spotlight—thanks to his dazzling work filling in for Oscar Moore alongside Nat King Cole, Illinois Jacquet, and other superstars —at the first of the prestigious Jazz at the Philharmonic concerts. All the while, Les Paul continued to pine for the perfect guitar. Though The Log came close, it wasn’t quite what he was after. In the early 1950s, Gibson Guitar would cultivate a partnership with Paul that would lead to the creation of the guitar he’d seen only in his dreams. In 1948, Gibson elected to design its first solidbody, and Paul, a self-described “dyed-in-the-wool Gibson man,” seemed the right man for the job. Gibson avidly courted the guitar legend, even driving deep into the Pennsylvania mountains to deliver the first model to newlyweds Les Paul and Mary Ford. “Les played it, and his eyes lighted up,” then-Gibson President Ted McCarty has recalled. The year was 1950, and Paul had just signed on as the namesake of Gibson’s first electric solidbody, with exclusive design privileges. Working closely with Paul, Gibson forged a relationship that would change popular culture forever. The Gibson Les Paul model—the most powerful and respected electric guitar in history—began with the 1952 release of the Les Paul Goldtop. After introducing the original Les Paul Goldtop in 1952, Gibson issued the Black Beauty, the mahogany-topped Les Paul Custom, in 1954. The Les Paul Junior (1954) and Special (1955) were also introduced before the canonical Les Paul Standard hit the market in 1958. With the rise of the rock ’n’ roll revolution of 1955, Les Paul and Mary Ford’s popularity began to wane with younger listeners, though Paul would prove to be a massive influence on younger generation of guitarists. Still, Paul and Ford maintained their iconic presence with their wildly popular television show, which ran from 1953-1960. In 1964, the couple, parents to a son and daughter, divorced. Paul began playing in Japan, and recorded an LP for London Records before poor health forced him to take time off—as much as someone so inspired can take time off. In the 1977, Paul resurfaced with a Grammy-winning Chet Atkins collaboration, Chester and Lester. Then the ailing guitarist, who’d already suffered arthritis and permanent hearing loss, had a heart attack, followed by bypass surgery. The family asks that in lieu of flowers, donations be made to the Les Paul Foundation, 236 West 30th Street, 7th Floor, New York, New York 10001. probably whip the guy with 20 notes."